Yesterday had all of us searching for shade. The sun was out and beating down on us. The trees and shrubs in our buffer: 30 feet between our property line and our fence, are now providing shade for the cattle. When we moved here there was a deer fence that didn't really work, as there were deer everywhere. We added 4 foot fence, electric wire on top and 2 feet of mesh fence on the ground. 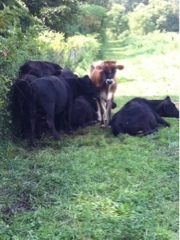 Now, most days when the sun is hot and the temperature is high, the cattle can find nice dense shade. Their mobile water/kelp/salt/mineral provides some shade, but nothing compares to the cool shade of densely growing greenery. As we were in the direct sun picking tomatoes, beans, cucumbers and corn we were a bit jealous of the cool herd.